Salt Lake City, UT: Univ of Utah Press, 1999. BRAND NEW Copy. First Edition, First Thus. Politcal, socio-enonomic demands of the last big dam ever built by the U.S.A. Award winning account of the 3rd dam in Glenn Canyon. The 1st was naturally shaped by sand in pre-historical times; the 2nd, of rock and soil, was that of the Anaszi prior to the 13th century. This is the story of the 3rd, a towering concrete arch-gravity dam on the Colorado River, Arizona. Towering 710-fooy high dam took a full 10 years (1956 -1966) to complete. Ranking among the largest of man-made reservoirs in America, the penned waters, named Lake Powell in honor of John Wesley Powell, who led the first expedition (1869)to traverse the Colorado's Grand Canyon by boat. 354 pgs in 12 chapter w/Epilogue & Maps.. First Edition. Soft Cover. NEW/None as Issued. First Edition. Toronto, Canada: D. Van Nostrand Company, 1939. Text/Bright, clean As New. Maroon linen boards w/gilt embossed title to spine/Fine. DJ/None. Textbook. Data visualization. Beautiflly illustrated work by Charles Elmer Rowe (1879 -) of the Univ. of Texas. First published in 1939, which is now introduced by Print-on-Demand softcover editions; this 12th printing of 1947. 299 pgs in 14 chapters. Representation of 3-D objects in two dimensions by using a specific set of procedures. The resulting techniques are of important consequen in engineering, architecture, and arts. Chapters are: 1, Introduction; 2, Principal Views; 3, Auxiliary Views; 4, Oblique Views; 5, Line & Plane Problems; 6, Surfaces & Developments; 7, Surfaces & Intersections; 8, Warped Surfaces; 9, Geology & Mining Probelms; 10, Engineering Problems; 11, The Mongean Method of Descriptive Geometry; 12, Shades & Shadows; 13, Perspective Drawing; and 14. Problems.. First Edition, 12th Printing, 1947. Hard Cover. NEAR FINE/No Jacket. Vintage/Descriptive Geometry. New York, NY: Gregg Division/McGraw-Hill, 1988. Text/BRAND NEW & Bright. Illustrated softcover/NF w/trace edge rubs. PO stamp to first title page & front/rear coves verso. First publiished 1966; this is the 4th updated Edition of 1988. 401 pgs w/photos, line drawings & diagrams, in 16 chapters: 1, Wood; 2, Cement, Aggregates & Concrete; 3, Concrete Admixtures; 4, Concrete Masonry Builiding Units; 5, Precast Concrete; 6, Brick or Tile; 7, Stone; 8, Fweeoua & Nonferrous Metals ; 9, Gypsum & Lime; 10, Glass; 11, Bituminous Materials; 12, Plastics; 13, Insulating Materials; 14, Acoustical Materials; 15, Adhesives, Sealers & Sealants; and 16, Protective & Decorative Coating.s.. 4th Edition, First Printing. Paperback. NEAR FINE/None as Issued. 4th Edition, First Printing. Englewood Cliffs, NJ: Yourdon Press/Prentice Hall Bldg, 1991. BRAND NEW Copy. 2nd Edition. 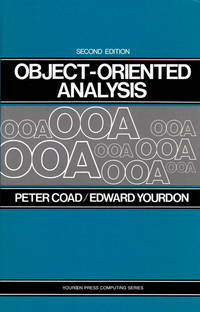 Objected-Oriented Design (OOD) written primarily for practicing software engineers who work with real-world systems daily. 233 PGS.10 chapters: 1, Improving Design; 2, Experiencing an Object Perspective; 3, Developing the Multilayer, Multicomponent Model; 3, Finding Class-&-Objects; 4, Indentifying Structures; 5, Intentifying Subjects; 6, Defining Attributes; 7, Defining Services; 8, Selecting CASE for OOA; 9, Moving to Object-Oriented Design; and 10, Getting Started with OOA, followed by Summaries and appendices.. 2nd Edition, 8th Printing. Hard Cover. NEW/None as Issued. New York, NY: Norman W. Henley Publishing, 1942. Text/Bright, clean, As New. Gilt embossed faux-leather maroon boards/Fine. DJ/None. Frontispiece: Four pursuit-interceptor fighters produced for Army Air Forces by Lockheed, Bell, Curtiss and Republic. 2nd Revised & Enlarged Editon. Basic aviation fundamentals written for students, mechanics and non-technical people. Treatise on princioles of construction and operation of all types of aircraft with illustrations and photos. 14 chapters: I, Facts About Aircraft & Industry; II, Lighter-Than-Air Craft; III, Heavier-Than-Air Craft; IV, Direct Control Autogiro; V, Airplane Construction; VI, Airplane Construction & Design; VII, Engine Types & Inspection; VIII, Airplane Propeller Types; IX, Airplane Control Methods; X, Airplane & Engine Instruments; XI, Blind or Instrument Flying; XII, General Inspection Procedure; XIII, Maintenance for the Private Owner; XIV, Modern Power Plant Development; XV, Recently Developed Aircraft Engines; and, XVI, Development in Airplane Design & Construction. 2nd Revised & Enlarged Ed, First Thus. Hard Cover/Stitched. Near Fine/No Jacket. New York, NY: John Wiley & Sons Inc, 1965. Text/BRAND NEW & Bright. Gilt embossed red linen boards/Fine. DJ/None. PO name to front cover verso. Published w/o ISBN; ISBN subsequently assiged. Editor, electrical engineer Harold Chestnut (1917 - 2001), Manager at General Electric, helped establish the fields of control theory and systems engineering. On identifying problems and useful tools for correction. 646 pgs. 10 chapters.. First Edition, First Thus. Hard Cover. NEAR FINE/No Jacket. New York, NY: Van Nostrand Reinhold, 1990. BRAND NEW COPY w/trace edge wear to dustjacket. Architecture. Textbook & Reference & resource for practicing professional. 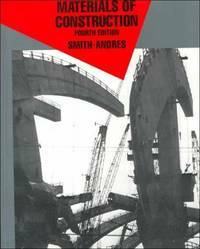 Detailed, interdisciplinary, practical guide to design and construction of building systems. 697 pgs. 17 chapters.. 2nd Revised Edition. Hard Cover. NEW/Near Fine. By Joyce, Maurice V.; Clarke, Kenneth K.
Reading, MA: Addison-Wesley Pub. Co., 1961. Text/BRAND NEW & Bright. Gray linen boards/NF w/trace edge rubs. DJ/None. PO stamp to upper text edge. Tidy, useful notes/marginalia to rear endpaper. Textbook. Design and use of transitors in circuits. Published w/o ISBN; ISBN subsequently assigned. 461 pgs. 16 chapters.. First Edition, 2nd Printing. Hard Cover. NEAR FINE/No Jacket. New York, NY: Longman/John Wiley, 1989. Text/NEW & Bright. Softcover/NF w/light edge wear & faint creasing to lower front corner. Bookshop price sticker to first title page & creasing to upper corner of title page. Textbook. Control system design from model to finished product --- pratical and theoretical treatment of on linear, single input/single out put and analog control systems (classical control). 364 pgs, 11 chapters. 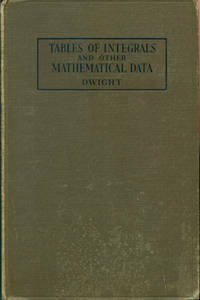 Text presented in three main parts: theory, case studies, and computer programs.. First Edition, First Thus. Soft Cover. NEAR FINE/None as Issued. Norman, OK: Campbell Petroleum Series, Inc, 1981. BRAND NEW & COLLECTIBLE. 5th Edition, 4th Printing of June, 1981. NOTE: At the point of publication, this book was "... in the progress of being presented in 4 volumes ... present book ... will be the new Volume 4." 350 pgs. Contents cover chapters 13 thru' 23: 13, Absorption & Fractionation Fundamentals; 14, Pumping, Compression & Expansion of Fluids; 15, Refrigeration Systems; 16, Liquefaction Processes; 17, Water-Hydrocarbon System Behvavior; 18, Absorption Dehydration; 19, Absorption Processing & Sweetening; 20, Overview of Sweetening & Sulphur Recovery; 21, Process Control; 22, Cost Estimate Principles; and 23, Plant & Equipment Principles, followed by 2 appendices.. 5th Edition, 4th Printing of 1981. Hard Cover. NEW - COLLECTIBLE/None as Issued. Champaign, IL: Matrix Publishers, 1978. Text/NEW and Bright. Softcover/VG; sound w/light edge wear, faint creasings to front, & trace surface wear. Textbook and manual centering on error analysis. "Expanded outline of important concepts of errors in engineering experimentation". 170 pgs. 14 chapters.. First Edition, First Printing. Paperback. Very Good/None as Issued. New York, NY: John Wiley, 1961. Text/BRAND NEW & Bright. Brick-red linen boards/Fine. DJ/NF w/nips, chips to edges & light surface rubs. PO name to fEP. Textbook based on "Switching & Computer Circuits" course taught by author at Univ of California, Berkeley. 363 pgs in 12 chapters w/application examples: 1, Binary Arithmetic; 2, Boolean Algebra; 3, Diode Switches & Logic Circuits; 4, Minimization - Single Function; 5, Minimization - Multiple Function; 6, Triode Switches; 7, Triode Logic Circuits - Voltage Switching; 8, Triode Logic Circuits - Current Switching; 9, Sequential Logic - Counters & Registers; 10, Sequential Logic - State Reduction & Assignment; 11, Bistable Circuits; and 12, Monostable & Astable Circuits. Strong copy.. First Edition, First Thus. Hard Cover. NEAR FINE/Near Fine. Vintage/Computers. By Clarke, Loyal; Davidson, Robert L.
New York, NY: McGraw-Hill, 1975. Text/BRAND NEW & Bright. Gilt emboseed black linen boards/Fine. DJ/NF w/short closed tear to upper front edge & trace wear to corner tips. PO stamp to fEP. 492 pgs. Reference and resource for process engineering calculations. 14 chapters: 1, Perspective; 2, Numerical & Mathematic Data; 3, Conversion Tables; 4, Physical & Mechanical Properties; 5, Thermodynamic Data; 6, Piping, Hydraulics & Flow Measurements; 7, Heat Transfer; 8, Combustion; 9, Power; 10, Pumps; 11, Fans, Blowers & Compressors; 12, Phase Equilibria; 13, Countercurrent Separations; and 14, Water.. Revised 2nd Edition, First Printing. Hard Cover. NEAR FINE/Near Fine. New York, NY: McGraw Hill , 1983. Text/BRAND NEW. White boards/Fine. DJ/None. PO name to all leading edges. Textbook. Introduction to optical fiber communication system designs. 318 pgs. 10 chapters: 1, Overview of Optical Fiber Communications; 2, Optical Fibers: Structures & Waveguiding Fundamentals; 3, Signal Degradation in Optical Fibers; 4, Optical Sources; 5, Power Launching & Coupling; 6, Photodetectors; 7, Optical Receiver Operation; 8, Transmission Link Analyses; 9, Measurements; and 10, Optical Fiber Fabrication & Cabling, followed by 6 appendices.. 5th Printing. Hard Cover. Very Good/No Jacket. By Safford, Edward L. Jr.
Blue Ridge Summit, PA: Tab Books, 1978. Text/BRAND NEW & BRIGHT. Softcover/VG; sound w/light edge & surface rubs. Bookshop stamp to 1st title page & upper text block. Pencilled note to rear cover verso. Guide to electrical equipement, power sources & standard of requirements for boats. 852 pgs, w/photos & diagrams. om 11 chapters: 1, The Environment at Sea; 2, Primary Electric Power & Wiring; 3, Batteries, Chargin Equipment & Electric Generators' 4, AC or DC Motor Operation & Troubleshooting; 5, Air Conditioning, Electric Galley Stoves, Lights & Radio Beacons; 6, Serve Systems & Automatic Pilots; 7, Gyrocompass System & The Sperry Autopilot; 8, Marine Communications Systems; 9, Marine Navigation Equipment; 10, Radar & Collison Avoidance Systems; 11, Sonar, Depth Measurement, Fish Findes, Speed Log & Doppler Docking Systems.. First Edition, First Printing. Soft Cover. NEAR FINE/None as Issued. Stated First Printing. Berkeley, CA: Ten Speed Press, 1989. Text/BRAND NEW & Bright. Spiral bound softcover/VG; sound w/trace edge wear & faint creasing to upper back corner. First published 1976; this is the 2nd Revised Edition of 1989. 467 pgs. Written for who have never held a wrench. 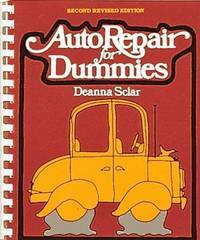 Comprehensive, lucid guide to car maintenance. 20 chapters augmented by photos, diagrams and line drawings.. 2nd Revised, 4th Printing, 1991. Paperback/Plastic Comb Spiral. Very Good/None as Issued. New York, NY: Industrial Press, 1969. Text/BRAND NEW & Bright. Burnt-orange, linen boards/Fine. DJ/None. PO stamp to fEP & ink mark to rEP. Manual on the properties of fuel oils; possibilities & limitations of each given grade; methos of quality control towards efficient combustion; and how to diagnose troubles. First published1951; this is the 3rd, expanded Edition of 1969. Author Paul Schmidt served as Chief Chemist with Allied Oil. 263 pgs, 18 chapters.. 3rd Edition, First Thus. Hard Cover. NEW/No Jacket. New York, NY: Popular Science/Harper & Row, 1978. BRAND NEW COPY w/trace push to corner tips of hardcover. DJ/None as Issued. 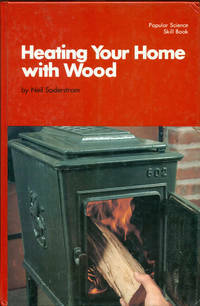 Highly informative, thorough & practical guide, w/some 150 photos & drawings, to heating the home with wood, either in its entirety, or only in part. 17 chapters: 1, Is Wood Heat for You? ; 2, What Happens When Wood Burns:; 3, Creosote & Chimney Fires; 4, Home Heating Principles: Airflow, Space & Insulation; 5, Fireplaces; 6. Wood Stoves; 7, Multi-fuel & Wood Furnaces; 8, Installing the Wood-Burning System; 9, How to Clean Chimneys & Stovepipes; 10, House-Fire Preparedness; 11, Comforts, Cooking, Fire Tending; 12, Wood Fuel; 13, Seasoning Wood; 14, Hand-Saw Basics; 15, Chain-Saw Basics; 16, Hand & Power Splitting; and 17, Doing Your Own Logging & Tree Work, followed by Appendix.. First Edition, First Thus. Hard Cover. NEW/None as Issued. Illus. by Vantage Art, Inc (Illustrations). New York, NY: Macmillan, 1934. Text/Near New w/tidy pencilled formulas to fEP & title page of Appendix, marginalia to pgs 115, 171, & 180. Brown linen boards/VG w/edge rubs & light fraying to spine edges. DJ/None. Initials to upper/lower text blocks. BEST/LAID IN: Errata: Taped to first title page --- afore mentioned marginalia reflect listed corrections. This is the First Edition, First Printing of Janunary 1934. Reference/resource. Helpful collection showing where the derivation of results is given, or where further similar results may be found. Major sectors are: 1, Algebraic Functions; 2, Trigonometric Functions; 3, Inverse Trigonometric Functions; 4, Exponential Functions; 5, Error Function, or Probability Integral; 6, Logarithmic Functions; 7, Hyperbolic Functions; 8, Inverse Hyperbolic Functions; 9, Elliptic Functions; 10. Bessel Functions; 11, Surface Zonal Harmonics; 12, Definite Integrals; and, 13, Differential Equations followed by Appendix. At the point of publication, Canadian-born author Herbert Bristol Dwight (1885 - ) was professor of Electrical Machinery at M.I.T.. First Edition, First Printing. Hard Cover. Very Good/No Jacket. By Burchard, Walther; Patterson, Gary D.
Berlin, Germany: Springer-Verlag, 1983. EX-LIB/UNCIRCULATED COPY. Text/BRAND NEW. 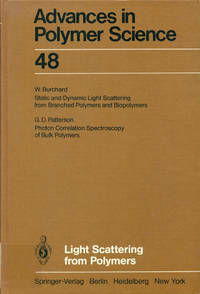 Burnt-orange linen boards/NF, This 1983 issue features two articles: 1, Static & Dynamic Light Scattering from Branched Polymers & Biopolymers (Walther Burchard); and 2, Photon Correlation Spectroscopy of Bulk Polymers (Gary D. Patterson). Fine copy.. First Edition, First Thus. Hard Cover. NEAR FINE/No Jacket.